We love the sun but we dislike the high humidity that often accompanies it. At least that seems to be the general consen­sus. While flora thrive in muggy, equatorial cli­mates, most humans do quite the opposite. If you’re anything like me, you’ll find yourself lethargic, sticky and frizzy-haired. There truly is little enjoyment to be had when the air is so thick you feel as if you’re wading through honey. JW Marriott Phuket’s General Manager, Matthias Y Sutter, with Co-founder Matt Kohler. How Generation Water’s innovative solutions work. The AERO20, one of many models available. 900 Marriott associates have attended Generation Water Solutions Training. However, Generation Water sees humidity as more friend than foe. 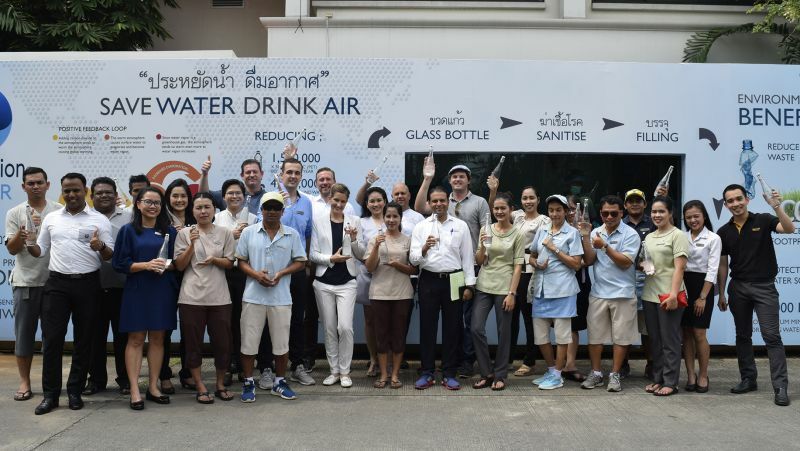 The Phuket-based start-up has developed an innovative technology which takes moisture from the air, filters it into fresh, mineral-rich drinking water and decants it into reusable glass bottles. This sustainable alternative to single-use plastic bottles has already made some serious waves here. In the last five months alone, their solution has replaced more than 200,000 plastic bottles in JW Marriott and Renaissance hotels. I spoke to Ryan Kohler, Co-founder and Chief Executive Officer of Genera­tion Water, to find out more about this wonderfully simple yet remarkable solution. The company’s conception can be traced back to June 2015. “My partner and I were living in Australia. We wanted to take a year-long sabbatical and go travelling around Europe and the US. Just before that, we had a massive family gathering on Koh Samui. We were walking along Chaweng beach – myself, my part­ner Meghan and my brother Matt – and it was littered with plastic,” Ryan explains. Regrettably, many of us will have a story like this one: a shoreline stroll spoilt by 7-Eleven bags, branded bottled water and sun cream half-submerged in the sand. Some of us will be moved to lobby local tambons; others will sign up for beach cleans; many will do nothing at all out of despondency at the situation. Ryan, Meghan and Matt felt compelled to find a comprehensive solution. “Initially, we were looking at having bins on the beach and getting hotels to hire people to empty them. We even looked at solar-powered beach cleaning robots! They cost an absolute fortune, though,” adds Ryan, laughing. However, it wasn’t until a trip to Koh Yao Yai the following week, in which Ryan and Meghan were confined to their hotel room by rainy season down­pours, that they came face to face with one of the major contributors to plastic polluted beaches. Realising that the root causes of the problem needed to be tackled in order to effect real, lasting change, Ryan and Meghan put their sabbatical on hold, re­turned to Australia and, alongside their day jobs, began in-depth market research. They were already aware of the technology of producing water from air. However, it became clear that, while the existing solutions were reducing single-use plastics, they were also using a great deal of energy and so the burden on the environment remained. It was time to find an economically viable and sustainable solution. The organic, unexpected formation of Generation Water is humbling. Al­though certified eco-warriors now, Ryan, Meghan and Matt carried no sustainability or environmental experi­ence with them on the beach that day. They come from: IT, systems and busi­ness; sales; and hospitality backgrounds respectively. However, these individual perspectives combined with sheer de­termination and knowledgeable inves­tors have made Generation Water the groundbreaking company it is today. Generation Water’s air-to-water ma­chines take water vapour – or humid­ity – that naturally exists in the air and condense it into distilled water, pure H2O. The water then enters an advanced filtration process to ensure purity. Minerals are added, in a similar way to the process that occurs in nature when water flows through rocks. The water is continually cycled through the filtration process to maintain freshness. Humidity must be above 35% for this process; certainly no problem in Phuket which boasts an annual average humid­ity of between 77.09% and 77.25% over the past 27 years. Now for the really mind-blowing stuff: whether the ma­chine is taking in crisp air from the un­polluted countryside or rush hour smog from Bangkok, you can expect fresh, healthy, alkaline water. Yes, really. Sleek, compact and minimalist, their machines certainly put the office water cooler to shame both aesthetically and environmentally. They offer large-scale solutions that produce thousands of litres of water a day – such as the solution for Marriott – as well as smaller scale solutions for use in homes, workplaces, schools, yachts and so on. Depending on the model, you can expect between 20 and 90 litres of water per day. It took the company two long years to receive accreditation from the Thai Food and Drug Administration (Thai FDA) whose rigorous process is based on the American system. Navigating the process – a sea of archaic govern­ment documents and bureaucratic red tape – was the most challenging experi­ence Ryan has ever faced. On reflection, though, he appreciates that it made their machines the very best they could be. Generation Water became FDA ap­proved at the end of August 2018 and were bottling water for JW Marriott ho­tels just days later on September 1. Ryan and Meghan’s mentor in Australia introduced them to the General Man­ager of Marriott in the country who, in turn, introduced them to Carsten Siebert, Area Director of Operations for Marriott. The team, suited and booted in 40ºC Bangkok heat, were given half an hour to pitch to one of the busiest men in hospitality. Fortunately, Carsten was on board within 10 minutes. Ryan admits that, in general, Gen­eration Water is not a hard sell, largely due to the three criteria that the team insisted on from the beginning. As a result, their solutions are eco­nomically viable and align perfectly with hotel corporate social responsibil­ity models. JW Marriott Phuket became the backdrop for the pilot given their his­tory of sustainability programmes. The Generation Water team, who were dis­persed across the globe – in Germany, Australia and Ryan’s native South Af­rica – all made the move to Phuket and truly lived and breathed the pilot. The statistics from the pilot are stag­gering and a testament to Generation Water’s hard work and JW Marriott’s social conscience. As mentioned, since September 2018 their solution has re­placed more than 200,000 plastic bottles in JW Marriott and Renaissance hotels, and in 2019 it will replace more than two million. In their place are elegant glass bottles with ceramic caps, chosen for their reusability, sanitation and aversion to dents and scratches. However, Ryan gives himself little time to celebrate this success. Although Generation Water’s air-to-water systems use 78% less energy per litre compared to standard bottled wa­ter, they are always seeking to reduce this further; for example, through solar and other renewable energies. The com­pany are also looking to branch out into stainless steel bottles for use on tours, in gyms and in other settings where glass isn’t an ideal material. Once their factory opens in mid- 2019, Generation Water will aim to supply all Marriott properties in south­ern Thailand and expand out to other hotels too. “On a global scale, there’s five coun­tries that make up 50% of the globe’s mismanaged plastic waste: China, Indonesia, Philippines, Vietnam, and Thailand. If we can make even a small dent in those countries, it has a massive global impact. By 2021, we want to be at a billion bottles a year,” says Ryan. The future certainly looks green. But what to do about the plastic already here?